Thanksgiving is a time for family, food, and football. Along the Alabama Gulf Coast, the warm weather can offer opportunities for creating new family traditions. Why not trade that cooking apron for a pair of shorts and flip flops? Several area restaurants make having the traditional Thanksgiving dinner a breeze. All you have to do is show up and enjoy. No long hours of cooking or cleaning with this option. Trade slaving over a hot stove and cold turkey for a warm beach front day filled with relaxation. In case you're already packing here's a few to consider: Be Thankful at the Hangout, 10:30 a.m. - 4:30 p.m. 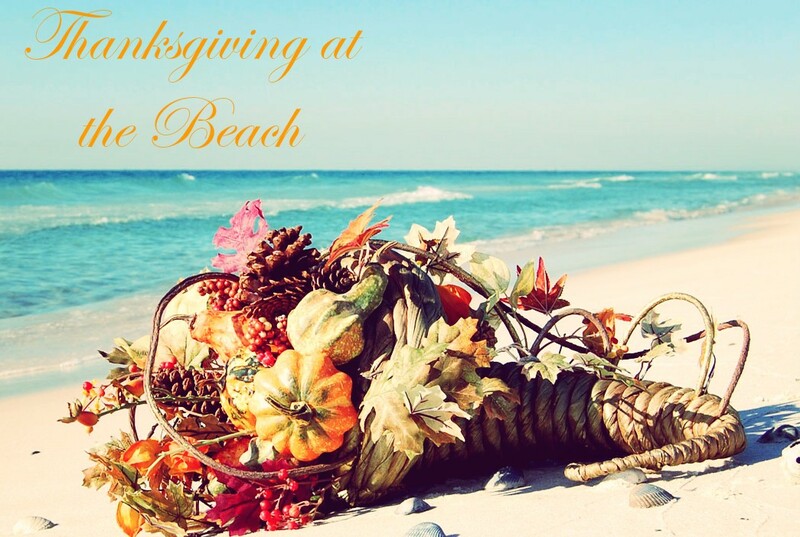 Traditional meal, Reservations needed, $24.99 per adult and $13.99 per child; Perdido Beach Resort Thanksgiving, Reservations needed; and the Flora-Bama Annual Potluck. Contact them for more information. The kids or grandkids have many options too. Arcades, mini golf, go-carts and the Alabama Gulf Coast Zoo are only a few activities that are sure to entertain all ages. For the Adults, the Tanger Outlet, Spanish Fort’s Eastern Shore Shopping Center, Pro-Bass Shop, Fairhope’s specialty stores and Mobile’s Bel Air Mall are all within an hour’s drive or less. Where else can you enjoy Christmas shopping then rest your aching feet in soothing white sand while listening to the waves? For the guys, golf, fishing, or kayaking are a few things waiting for them if they can step away from all the games on TV. But they won’t have to look far to enjoy those either, check out any of the local restaurants for times. 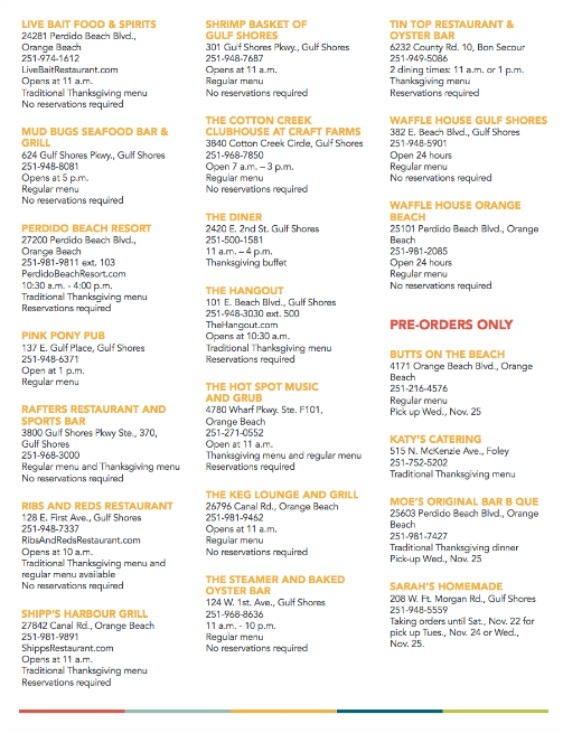 You may have missed your opportunity this year for creating new Thanksgiving traditions along the Alabama Gulf Coast. Don’t let another holiday pass you by. Start by investing in your future which is always an investment in your family. Contact us today and see what types of property are available that will fit your family's lifestyle and budget. There’s something for everyone here. Don't forget that family get-togethers are the perfect time for those rare family photos. There are many photographers here waiting to make your memories last. We're talking complete family Thanksgiving package! So, what are you waiting for? Put that turkey back in the freezer, grab your suitcase, and head on down to the warm sunny beaches of the Alabama Gulf. 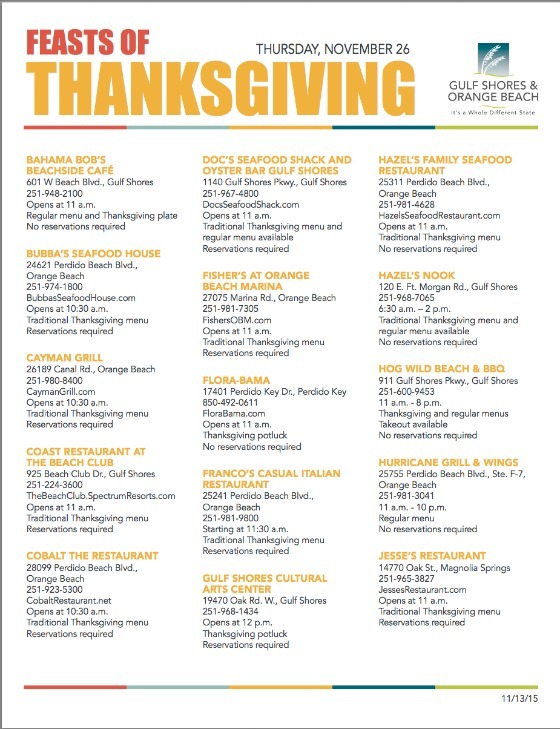 For your convenience, here is a listing of all restaurants opened on Thanksgiving Day.